In this post, we will cover features of Java ArrayList class. We will discuss its features and well-known use cases. The ArrayList grow and sink dynamically when we add/remove elements from it. ArrayList use the array as an internal data structure to store element. This provides flexibility to use elements using the indexes. ArrayList allows to store duplicate values including “null” values. It is an ordered collection i.e. it maintains the insertion order. It only allows objects in the ArrayList. For primitives values like int, long etc. use the wrapper classes. Java ArrayList Iterator and ListIterator implementation is fail-fast. ArrayList is not thread safe. We need to apply synchronization if multiple threads will change ArrayList at the same time. 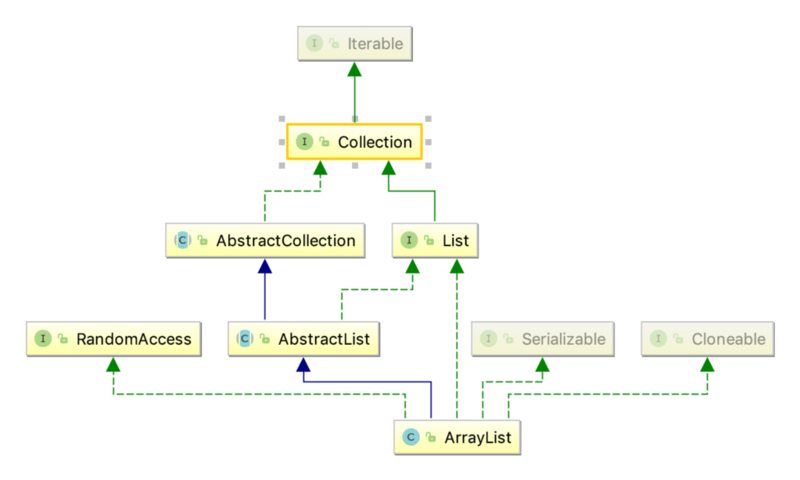 Here are known parameters for the Java ArrayList complexity. Add operation has O(1) complexity. Contains operation have O(n) complexity. On a high level, we have the following way to create a new ArrayList in Java. Pass initial capacity in the constructor. Pass Java Collection as a constructor parameter. This is one of the most common ways to create ArrayList in Java. We are creating an empty ArrayList. This method helps to Constructs a list containing the elements of the specified collection. While creating ArrayList, we should keep in mind following extra points. ArrayList is generic, and it’s always recommended to pass element type to let compiler make sure data integrity. ArrayList implements List interface, and it’s a good practice to use generic interface for better decoupling. We can add elements by calling add() method or if required we can add an element at the specified position using index property. We can also add multiple elements at once. There are two options to create an ArrayList from another collection. Use the ArrayList​(Collection<? extends E> c) constructor to pass the collection as a parameter. Use addAll​(Collection<? extends E> c) method to append all the elements in the specified collection to the end of this list. There are two variations of the remove operation in ArrayList. Use remove() method to remove an element by value or using an index.remove() by Object will remove the first occurrence of the specified element from this list. Use removeAll() to remove from this list all of its elements that are contained in the specified collection. We have two different ways to iterate elements of the Java ArrayList. Iterator – Provide option to iterate a list in one direction. Java 8 brought several fundamental changes to the API. Use forEach() method directly in the list to performs the action for each element of the Iterable until it has processed all elements or the action throws an exception. ArrayList provides several options to search elements through the list. Use indexOf() and lastIndexOf() methods to get index element for the method. contains(Object) – Returns true if this list contains the specified element. Use the size() method to find the size of ArrayList. The Get() method provides the element at a particular index in an ArrayList. Use the set() method to change or set element at a particular index. The isEmpty() method to check if ArrayList is empty. In this post, we discussed the ArrayList in Java. We learned how to create a new ArrayList in Java and how to do different operations on the ArrayList.